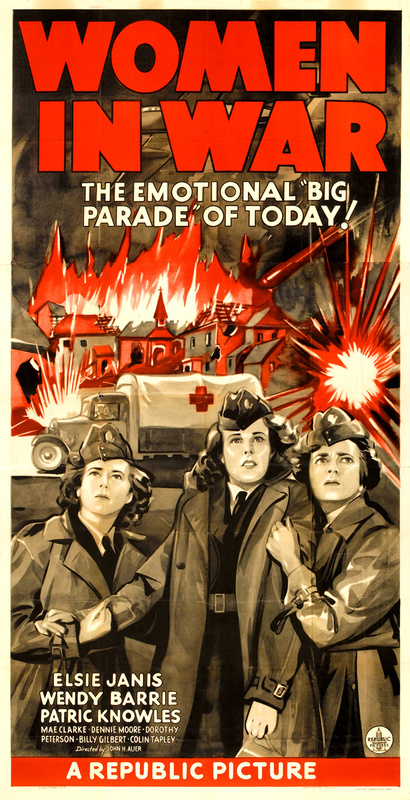 Republic’s 1940 feature Women in War is rare enough that you won’t ever happen upon it on television, and are unlikely to see it at all short of a concentrated effort to do so. It tallies a mere 15 votes on IMDb, alongside three user reviews, two of which are by fellow completist Arne Anderson — one of which reports that the film is utterly unavailable, the second written after he managed to track it down — as I recently did. After years of wistfully staring at this title on my to-see lists, I was awfully disappointed by it when I finally got the chance. Women in War is emblematic of the naïvely casual and overly romanticized outlook the movie-going public had in those months of 1939 and early 1940 that historians now refer to as the “phony war,” before Dunkirk, when the situation changed dramatically. During the very same week that this film was released to theatres, global newspaper headlines told the horrific story of the British Expeditionary Force’s chaotic evacuation from France, which forced the public to reformulate its attitude and its commitment to the total war effort. It’s unlikely that a film such as this, which employs a wartime milieu without the gravity it demanded, would have even been made had it been scheduled for production just a few months later. The spate of nursing pictures — even the overtly romantic ones — that would soon issue from the studios went out of their way to not only demonstrate the value of nurses, but also the incredible risk and toil required to be one. Yet that seems to be precisely the notion that all of the nurses have, and the film does nothing to dispel them. There are no wounded soldiers to tend to, no tragedies along the way, and no sour news from other fronts. The war seems terribly far away, if it’s even happening at all. All our nurses have time to do is chase fliers, and all they have to be concerned with are the most immature aspects of their schoolgirl romances. The film’s finale is its most damning sequence: When the nurses are ordered to drive desperately needed medical supplies to the front, Gail — our ‘woman scorned’ — childishly forsakes her duty in order to exact revenge on Pamela. She diverts their vehicle into an evacuated French village that is under heavy bombardment, hoping to get them both killed. When O’Neil realizes what has happened, she too drives her truck into the village — showing audiences that as far as these nurses are concerned, the needs of the wounded on the front lines finish a distant second to their own personal drama. And when the shells really start dropping, too many of the nurses lapse into hysterics. In June 1940 the Battle of Britain was in the offing, and the terrifying nights of the Blitz would then follow. It was a time when English and Canadians — and soon Americans — of all ages and from all walks of life were asked to make extraordinary sacrifices on behalf of their nations and one another. Women in War is a shallow film that fails to measure up to the requirements of its time. Its women are shallow, silly, and incompetent rather than confident, devoted, and strong. When inspiration was needed, it stooped merely to entertain.